I only very recently discovered the Land of Blog, but I have a feeling my life will never be the same. Now, at night when I am usually too exhausted to do anything but watch television, I find myself tunneling deeper and deeper through this blog which leads to that blog which leads to that blog…until I truly end up feeling like I have fallen down this vast rabbit hole…and I have no idea how to get back above ground, and then I’m not really sure I even want to (but shhh, don’t tell anyone). It is amazing down here! So many wonderful, talented writers, artists, photographers, comedians…all sharing what is deep in their hearts, their minds, their lives. It is easy when you are an artist, especially when you work at home, to feel isolated. And it is hard to find time to venture out and about to share these kinds of thoughts, inspiration, tips, tricks, and encouragement. It’s a little scary though, because now I have even fewer reasons to leave the house. Can you say hermit? How did I manage to step over this hole for so long? I mean, I knew it was there, I had heard of blogs, but I had never actually visited one. And then… I found this magazine called Artful Blogging. It was pretty. I bought it. I visited one of the blogs that was featured. And that lead to one more, and then one more, and well, you get the idea. I think we all need to hire housekeepers so we can spend more time down here. Because, unlike television (which is far less entertaining by the way) the people down here are real. Really real. Not pretend real like the people on so-called Reality Television. Which, okay, I may have been addicted to for just a little while…but don’t tell anyone that, either. Please. I haven’t told very many people in my “real” life about my blog yet. Maybe because I fear that they will think I’m self-indulgent. Or silly, or just plain nuts. But at least down here, I am among friends. You won’t laugh at me for having a blog. You probably have one, too. They are multiplying like rabbits. Maybe I should have called this post Watership Down. P.S. The bunny in this photo lives in my yard. 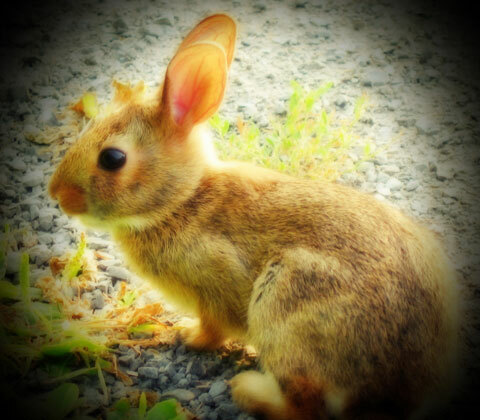 He/she was the sole survivor of an overly rambunctious dog who thought it would be fun to play with tiny baby bunnies. It wasn’t fun and the dog’s human mother was very, very upset with him. But this little bunny (at the time about 4 inches long), burrowed its head down into the grass amongst the bodies of his brothers and sisters and played dead. And melted my heart. And survived. So now I don’t get mad when the bunnies eat my flowers. I figure I owe them one. This entry was posted on Monday, March 1st, 2010 at 4:22 pm. You can follow any responses to this entry through the RSS 2.0 feed. You can leave a response, or trackback from your own site. Hi! A friend sent me a link to your blog. I can’t believe you haven’t been here forever, I feel an instant kinship! I am so excited to have found you. oh my gosh, that is the best compliment…someone sent you my link? I am swooning….thanks so much for stopping by…I am so excited that you found me! Another work of sheer brilliance, as always. You really are an inspiration to me as a ‘youngster’ in this crazy world to see beyond that insanity and realize what is important. Thanks for always bringing me back down to earth when i read your blogs.. I stumbled upon your blog today, and immediately fell in love! I’m trying to be so much better about blogging, but with all of you writing such wonderful/witty stuff, I find myself wanting to READ instead of WRITE. I too, love it “down here” and can only keep tabs on some of my far-flung art girls through their blogs, flickr or facebook. Please stay down here … I’m excited to “see” what you discover! Thank you so much for stopping by, and for your very kind comments! Yes, I have the same problem, I could spend days at a time just reading other people’s blogs…trying to limit myself to a few hours a night but that is still probably way too much…but still better than another episode of Clean House! This person from “real life” is in awe of your observations. I come here to read as a “reward” after completing my daily tasks! just for the record: i have hired a housekeeper. two actually. Wow – you immediately feel like my ‘blog-sister’ with your words! Thankfully, Julochka (Moments of perfect clarity) suggested taking a look at your blog. SO glad I did. You’re immediatley on my bloglist. Keep up the fabulous writing and humorous insights and I’m totally looking into a housekeeper – such a good idea! Cheers! Thank you so much… I really appreciate it!